In recent years, set-top boxes have been shrinking down to tinier, cheaper packages with a growing list of fun new features. The new Fire TV dongle with 4K, HDR, and Dolby Atmos showcases some of the best aspects about this trend. It’s cute. It’s a thrill to use. It’s just $70. The only problem is that you still can’t use the new Fire TV for everything. It’s very good, but it’s not the very best. The all-new Fire TV isn’t even a set-top box by the most conventional definition of the gadget. It sits atop of nothing. The dongle plugs directly into your TV’s HDMI port, hangs behind the screen, and plugs into a power source. Setup is as easy as plugging two cables. Meanwhile, there’s a 1.5 GHz quad-core processor, a dual-band 802.11ac wi-fi antenna, 2GB of memory, and 8GB of storage in the deceptively small black dongle that adorably looks like a shrunken version of the old Amazon Fire TV box. There’s even an Alexa-enabled voice remote to make it easier to find your favorite early-90s action movie. When you shrink a set-top box down to the size of a stick, some sacrifices need to be made—namely the ethernet port and SD card slot. Both are missing on the new dongle. Amazon makes up for the first omission by selling a $15 ethernet adaptor. This gadget is a must-have for anyone who wants to stream 4K content but lacks a extremely fast and dependable wi-fi connection. That SD card slot, once so handy for watching downloaded movies or expanding the Fire TV memory, it’s gone for good. Sorry, pirates. 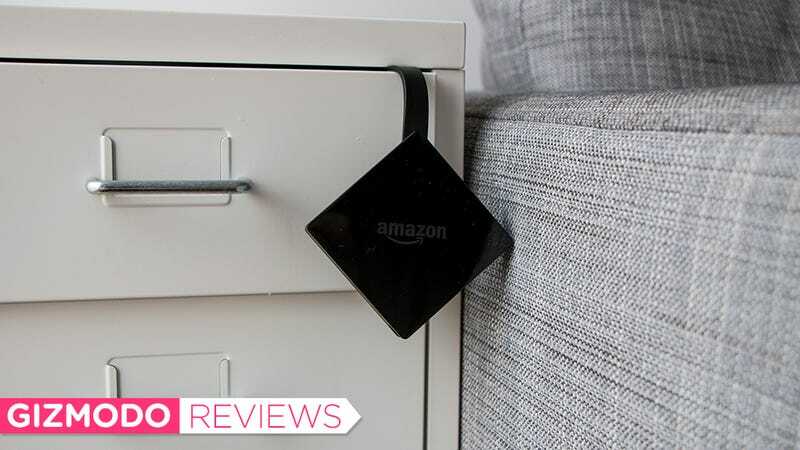 Most people will love this tiny Fire TV for what is: a cheap and easy way to watch streaming content. On that front, the dongle does it all with panache. Gone are the days of the clunky interface that plagued the first Fire TV. Past are the frustrations of the original TV stick which was underpowered and slow. The all-new Fire TV is slick and quick. The first time you power it up, you’re browsing through movie and TV options in about five seconds. Browsing through menus presents no noticeable lag time, and content loads instantaneously. The Fire TV a damn good dongle when it comes to these basics. The voice-enabled remote makes everything even snappier. You can use it for basic input, like the name of a movie you want to search, or you can go into full-on virtual assistant and beckon Alexa to do anything from recommend a late-70s crime drama to dimming your Philips Hue lights. The new-ish Fire TV operating system is a thrill to use, especially if you like to buy stuff on Amazon. Amazon haters will unsurprisingly hate the Fire TV experience. 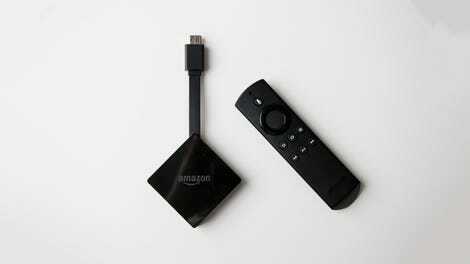 Just like its predecessors, the new Fire TV and the new-ish operating system focuses heavily on Amazon content. That means you’re pushed towards buying and renting movies through the Amazon Video service. If you’re a Prime member, you’ll also see all that Prime Video content featured prominently. The new interface does give content from some apps, like Netflix and HBO, some placement on the home page and individual verticals (e.g. Your Videos, Movies, TV Shows). But the Fire TV is most decidedly an Amazon-first experience. Even though it remains out of view, the Fire TV dongle is quite handsome. None of this comes as a surprise in the world of set-top boxes, sticks, and dongles. Apple TV is definitely an iTunes-first experience. Chromecast is very Google-first. However, the extent to which Fire TV is the opposite of platform agnostic is sure to raise some eyebrows for those of you who might be deciding between buying a Fire TV and buying a Roku. Roku, after all, has built its entire ecosystem around the idea of being platform agnostic. A few weeks ago, Roku announced its newest device, the Streaming Stick+. This $70 gadget does everything that the new Fire TV does, including 4K, HDR, and Alexa voice commands. (The Roku Streaming Stick+ does not, however, support Dolby Atmos audio.) On the software side of things, the Streaming Stick+ features the latest Roku operating system with unique features like the ability to search for a movie and compare prices across different apps. Roku is also really good about making 4K content easy to find on any app, whereas the Fire TV only shows you 4K content you can access through Amazon services. On the hardware side of things, the Streaming Stick+ offers a new remote with an amazing feature: the ability to control your TV power and volume. The Fire TV will leave you fumbling with two remotes. The remote thing is a game changer for me. I honestly can’t believe Amazon didn’t add similar TV controls to the Fire TV remote, but maybe that’s for next year. The new Roku Streaming Stick+ next to the new Amazon Fire TV. The Fire TV goes on sale tomorrow. It’s a great gadget, especially for you Amazon lovers. It almost does it all, too. If it weren’t for that “almost,” I’d use this little dongle every day, just like I did with the Fire TV predecessors. But I’m a Roku guy now, and I’m not looking back. Remember when these things used to be huge? Almost every feature you could want in a set-top box: 4K, UHD, Dolby Atmos, Alexa, etc.